I have a problem. I can't stop thrifting books. My TBR pile is overflowing, I have books stashed everywhere, and still I buy cheap books. Anywho, here's what I picked up in my latest thrift store visit. Let's start with the bad: Fifty Shades of Grey by E.L. James. Sigh. I know. I bought it because it had such a cult following, and even though reviews are terrible, I guess I'm just a glutton for punishment. Prey by Michael Crichton is one I've been meaning to read after reading Jurassic Park. I've become quite the little Crichton fan, but I'm still slowly working my way through The Lost World, so I'm not sure when I'll start this. Laughter in the Dark by Nabokov was one I hemmed and hawed over in the aisle. I'm still not sure about it. Ghost Story by Peter Straub comes highly recommended by Stephen King. We all know I'm a massive Stephen King fan, so I immediately snatched this one off the shelf. He could probably recommend reading boot tracks in dirt and I'd do it. What am I currently reading? 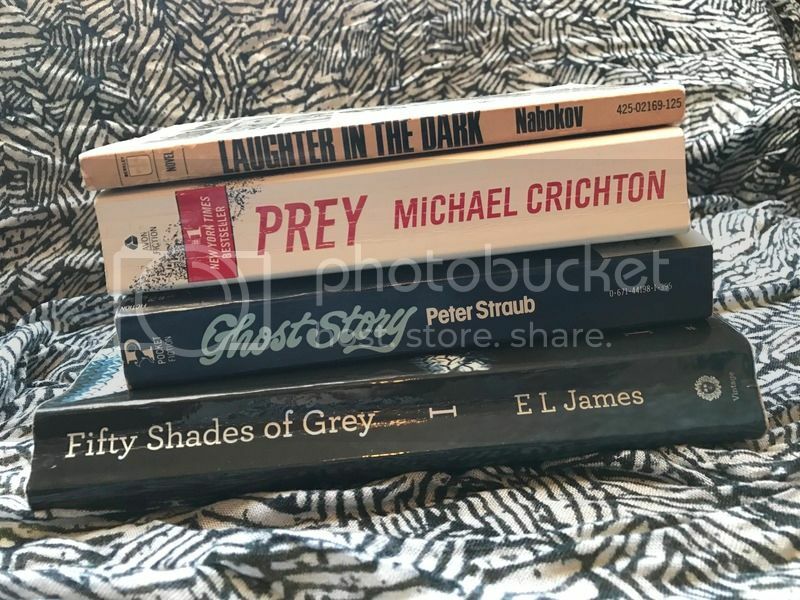 The Lost World by Michael Crichton, which is dragging on and on, The Stand by Stephen King, and The Passage by Justin Cronin. I've not had much time to sit and read, but I get a few pages done here and there. Are we friends on Goodreads yet? Hello! I'm Kate, an RVA based lifestyle blogger. I'm a bookworm, baseball umpire and player, Bob Seger fan, beauty hoarder, and mama to two spoiled dogs. Katelyn has read 0 books toward her goal of 50 books. lucky bandit is a for profit blog. I use affiliate links and paid advertisements. I may earn compensation for a click or purchase through a link. Paid (whether via product or monetary) reviews will be noted in the actual post. Though compensation may influence the type of posts, all opinions and reviews will be legitimate and honest. © 2008–2018 by Katelyn Carter. © Katelyn Carter 2014. Powered by Blogger.